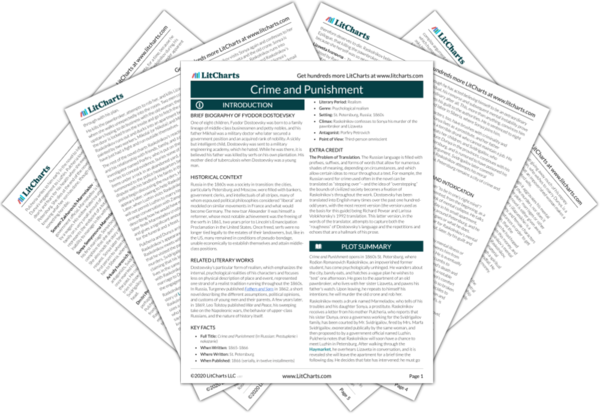 Instant downloads of all 942 LitChart PDFs (including Crime and Punishment). 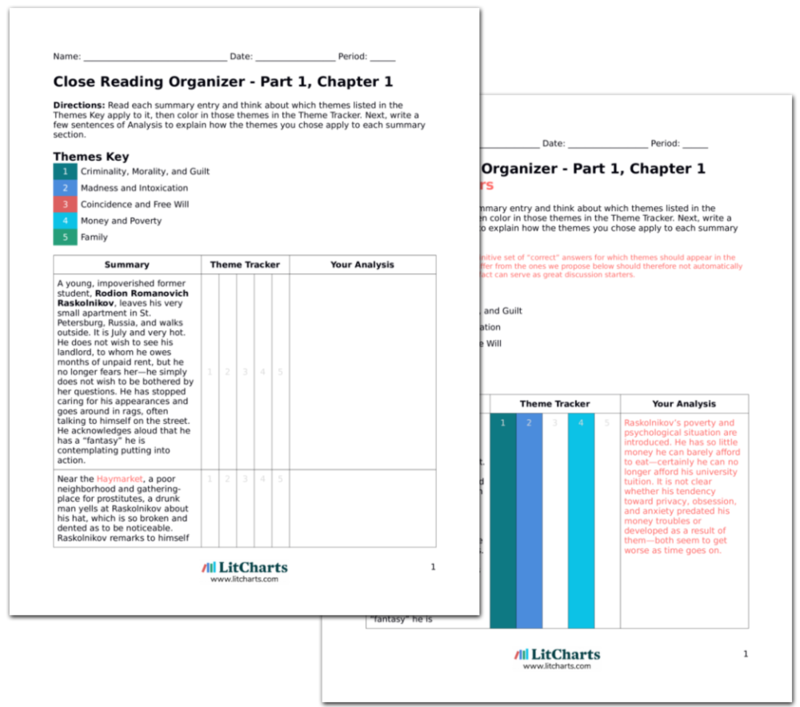 LitCharts assigns a color and icon to each theme in Crime and Punishment, which you can use to track the themes throughout the work. Raskolnikov and Razumikhin enter Porfiry’s office laughing, lending, in Raskolnikov’s mind, a “natural” air to his behavior. Razumikhin introduces Raskolnikov and Zamyotov enters—Raskolnikov begins losing his “natural” air and grows nervous. Raskolnikov informs Porfiry of his story: that he was merely a customer of the pawnbroker’s who now seeks to find his stolen goods. Porfiry tells Raskolnikov to make a statement to the police; Raskolnikov fears that Porfiry knows he is the murderer. Raskolnikov hopes that his “casual” entry into Porfiry’s office will convince the investigator that Raskolnikov has nothing to hide. But Raskolnikov also perceives that Porfiry is a shrewd and intelligent detective, and that he will have to outwit Porfiry if he is to maintain his innocence. From the beginning, Raskolnikov fears that Porfiry sees through his lies. In another important piece of evidence against Raskolnikov, Raskolnikov is the last of the pawnbroker’s customers to visit Porfiry. This means: Raskolnikov simply does not care about the articles he pawned, or he has some reason to avoid the police. Porfiry therefore has the upper hand in the interrogation almost immediately. Raskolnikov fears that Porfiry has learned, also, of his visit to the pawnbroker’s apartment after the murder. The conversation turns to Razumikhin’s argument with Porfiry from the previous day’s party. Razumikhin begins criticizing a supposed “socialist” view of crime, which blames criminality on the perpetrator’s environment. Porfiry argues that environment is responsible for some amount of all crimes. He then references an article written, semi-anonymously, by Raskolnikov on the nature of crime. Raskolnikov remembers having written it, but did not know it was recently published. This article has not been mentioned before in the text. Indeed, Raskolnikov’s work during his school days is barely described in the novel. But it is clear that Raskolnikov has spent a good deal of time mulling over the nature of criminality, and the psychological constitution of those people who decide to commit crimes. The article describes the psychology of a person committing a crime, and derives from Raskolnikov’s studies as a law student. Porfiry is struck in particular by the end, which argues, for some extraordinary individuals, ordinary laws do not apply and indeed these laws must be broken. Raskolnikov attempts to clarify his statement, saying that “Great Men,” as determined by society, often break the laws of their time in the formation of new laws, or a new morality. He cites Napoleon as an example. Raskolnikov’s argument is not dissimilar from an argument later developed by Nietzsche regarding “strong” and “weak” moralities. “Strong” people are those who, in their actions, are able to create their own laws—society follows the behavior of these individuals, whose will eventually dictates the rules of a new society. Weak people must follow the rules set forth by their strong counterparts. Raskolnikov seems to consider himself to be a strong person, and yet his behavior marks him as anything but strong. 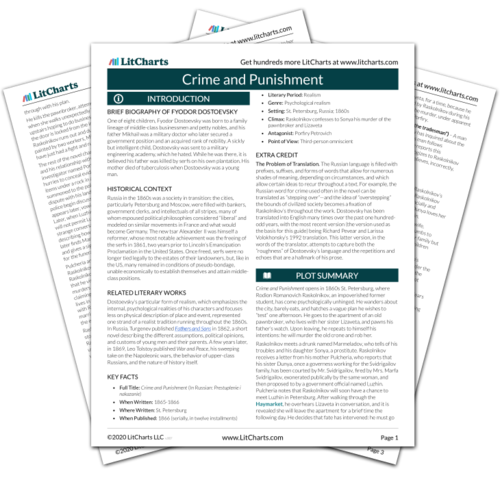 Get the entire Crime and Punishment LitChart as a printable PDF. Porfiry asks whether Raskolnikov believes in God, the New Testament, and in particular the story of Lazarus, who is raised from the dead by Jesus in the Book of John. Porfiry goes on to ask how one might know if a person is ordinary or extraordinary, and what happens if a person is misidentified. Raskolnikov replies that a person who is ordinary but pretends be extraordinary will eventually be found out, before he has caused too much trouble. Raskolnikov also states that the truly extraordinary are extremely rare. A first reference to Lazarus, a character mentioned in the Gospel of John and an important symbol in the novel. Lazarus was raised from the dead by Jesus though he had passed away four days previously and had already been entombed. Raskolnikov becomes obsessed with this story and later asks Sonya to read it aloud to him. Raskolnikov also separates suffering and guilt from the ability to commit a crime, arguing that even great individuals, who are “permitted” by society to overstep the bounds of the law, will feel some pang of conscience for the harm they do. The question is whether they can overcome this pang and be convinced of the eventual rightness of their actions. Razumikhin asks whether Raskolnikov considers himself an extraordinary person permitted to commit crimes—only half seriously. Raskolnikov says that, if he were, he wouldn’t announce it publically—he adds that he does not believe he is a Napoleon. Raskolnikov, interestingly, does not seem to know whether he is an ordinary or extraordinary person. His ability or inability to “overstep” the crime and create his own law determines the outcome of the rest of the novel. Porfiry has a final question for Raskolnikov before the latter leaves: he asks if Raskolnikov saw the painters on the day of his visit to the pawnbroker. Raskolnikov admits he was there on the day of the murder but claims not to have seen the painters. Razumikhin, however, steps in and says Raskolnikov must have been mistaken, since he only visited the pawnbroker two days before the murder to pawn the watch. Raskolnikov says he was mixed up and only present before the murder, and the two leave the office quickly. Raskolnikov is here tricked into giving away a crucial bit of information. Before, Raskolnikov maintained that he was not present in the apartment of the old woman the day of the murder. But Porfiry has so flustered Raskolnikov that the latter admits to visiting the old woman on that day. This is another piece of psychological evidence that Porfiry will later use against Raskolnikov. Schlegel, Chris. "Crime and Punishment Part 3, Chapter 5." LitCharts. LitCharts LLC, 2 Oct 2013. Web. 16 Apr 2019. Schlegel, Chris. "Crime and Punishment Part 3, Chapter 5." LitCharts LLC, October 2, 2013. Retrieved April 16, 2019. https://www.litcharts.com/lit/crime-and-punishment/part-3-chapter-5.